Why Is It Some People Get So Much More Done And Earn Bigger Rewards, Yet Others Struggle Just To Get Started? Let me reveal to you how you can become one of the rare few successful bloggers who get real results using less time. You don't want to be one of the majority of people who waste hour-upon-hour and never build a money making blogging business. I bet there's a few key things that you don't even realise you're not doing right now… that would make a huge difference to the amount of actual output you create on any given day. …And they don't understand why. But for some reason, no matter what they do, there just doesn't seem to be any significant movement forward. What if I had a guide that would help you turn that all around to where you're actually working less but you're getting WAY MORE done by using just 3 really powerful techniques. What do you think… would you be interested in this guide? So let me tell you what you're going to get out of it. But before I do, I'd like to introduce myself. Okay, I'm not going to mince words. Really are the kick in the pants to get you started! I've kept it to 90 pages so there's no fluff or filler. It's simply packed with the core stuff you need to know if you want to succeed. 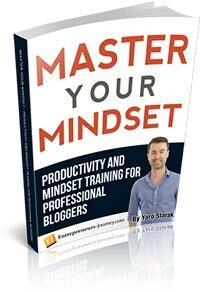 I've combined traditional thinking about productivity and mindset, but also spotlighted what I've realised have become the most important things to me as a successful blogger and online entrepreneur. After I introduce you to these 3 primary concepts, I provide more targeted productivity techniques to help with the following challenges I know you face. Everyone has times when they're feeling crappy and not very motivated. This chapter addresses the issue and shows you exactly how to charge through that barrier. Locating your “Productive Sweet Spot” and using it to build the right structure around your life for getting things done. Want to have a 2-hour work day and spend the rest of your time enjoying yourself? I will explain how you can do it. I'm going to show you how to smash through these “problems” and explain how to deal with damaging thought processes that destroy your chances of success before you even begin. Common fears: Do any of these sound familiar? These are more limiting beliefs, and I'll show you how to conquer them too. Positivity Training And Learned Optimism. In order for you to achieve success online you have to believe that you can, and support your beliefs with thought patterns that help rather than hinder your progress.This is where positive psychology it absolutely vital. How to actually start your business when life is already too busy. This chapter covers limiting belief issues like “There's too many things going on in my job and I can't get any work done” , “I'm not sure what kind of business I need to start” and “I have too many ideas.“…and much more. You don't need to build a massive team from day one. I'll show you when to reach out and when it makes more sense to do it yourself. How to choose the right opportunity. Everyone is always saying this or that is the opportunity of a lifetime and it can feel overwhelming! What do you choose? What if you miss out? What if you make the wrong choice? I'll show you how to remove the feeling of overwhelm and pick what's right for you based on your current situation and skills. IMPORTANT QUESTION: “Are you drowning, treading water, or swimming?” Have a good look at what you do each day… are those activities moving you forward, keeping you where you are or actually taking you backwards? How to break the pattern of average results… and start getting BIG results! How people go from just-surviving to life-changing results. Hint: Figure out what you do well, and do it well over and over again. Manufacturing perfect timing. I'll show you how you can be in the right place at the right time with your business. You don't need to rely on luck or chance to succeed, there is a formula that delivers results. 7 tips to help you make a million dollars – What I consider THE MOST important parts of what I've done with my business that led to making a million dollars online. These are FIVE brand new, half-hour long each audio recordings packed with my best ideas. They are current and feature what I have learned and applied as the KEY productivity and mindset techniques from the last couple of years. The audio is just me talking to you in MP3 download, or you can read the premium transcript created by USA based transcriptionists with English as a first language. Listen in when you are jogging or bike riding, driving to work, catching a plane, going for a walk or hitting the gym. These are not available anywhere else and you can download them all instantly after you order my Master Your Mindset E-Guide package. Theory of Constraints – I reveal how this concept came into my life, why I believe it is the most important focus tool you will ever come across, and how exactly can you apply it to blogging and information marketing. The Sprint Technique – Taken from the world of software development, I explain how you can apply micro-bursts of super-focused productivity to your blogging business. Lean Product Development – Lean is cool right now in the world of startups, but we can apply it to blogging too. I'll show you how to use lean methodology to test your blog and info product ideas quickly. Energy Management – This is such an important audio. You may not realise this, but what you do when you are not working is as important as when you do work. I'll explain why, introduce you to the Ultradian Rhythm and more in this mindset session. Inevitability Thinking and Positivity Training – I learned to apply techniques like positive psychology and CBT in response to panic attacks when I was younger. In this audio I will explain how this experience led to one of the most important mindset changes I have ever made and how it applies to your business. 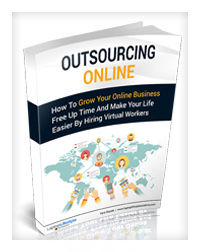 Why would you use outsourcing? What constraints can you outsource to other people? 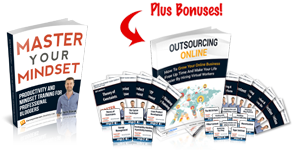 It's not that I don't recommend these services – I do – but nearly every single good virtual worker I have hired was a contractor from my country (Australia) who I found through networking online (social networks, blogging, email newsletter, forums) or offline (friends of friends, networking events). This guide explains how I have hired mostly stay-at-home mums and local freelancers. 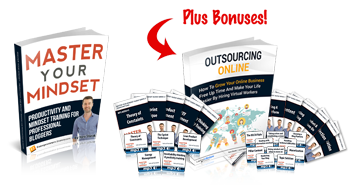 I think you will find it different to most outsourcing guides out there. Background Story: I created these audios 2 years after I started my blog and gave them to my very first paid blog coaching members. I'd just been through the initial stages of building a blog from zero to making $10,000 a month using advertising and affiliate income. The techniques I used were very fresh in my mind when I sat down and recorded each of these mindset sessions. Although these audios were produced years ago, I was very much focused on fundamentals when I recorded them, and fundamentals don't change. You will hear the odd dated comment, but 99% of the content is just as applicable today as it was back then. Every new or even experienced blogger should listen to these at least once (my previous coaching members have given me so much positive feedback on these, I know you will love them). Each of these three bonuses are available for immediate download along with the Master Your Mindset e-Guide. That's 15 audios and two E-Guides all in the one package. Why is it so important to get your copy now? That's why it's so important to get your copy of this guide today. If you repeat what you have always done, using the same way of thinking and the same way of working, then you will get the same results. Don't mess around, sort this out from the beginning and enjoy the feeling of satisfaction that comes from meeting your goals. All you have to do is think right and do the critical actions in the intelligent order… using this guide is the perfect way to get that foundation in place. …And from there you just rinse and repeat each day. Do this, and you won't get that sense of overwhelm, instead you will know you are moving forward. You'll see progress because you're working on only the most important things. You'll eliminate any fear or stress that you're doing the wrong thing, or there are other things you could do instead, because I teach you how to see the clear path to success that is in front of you. 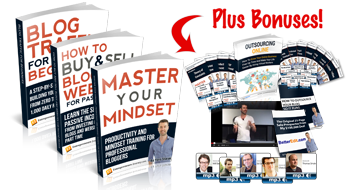 You receive the complete “Master Your Mindset” Eguide Package, including 110page guide and two bonuses, all as instant downloads. That's it from me, I'll see you on the inside of the members area. Your words are the usual delicious mix of inspiration, common sense and experience. I was waiting for your teaching on this, and as usual you did not disappoint. Oh, boy. This is exactly what I needed to hear today. I have found that I am not very good at multitasking or working on too many projects at once. I need to focus on only one goal at a time. You are right about focusing on improving one thing and allowing everything else to go into maintenance mode. This is the perfect cure for today's scatterbrained thinking and self-defeating mindset. Thanks so much! Yaro, I could say that you taught me 80% of what I know about blogging, the other 20% I researched. After a year of blogging trying to find my passion today I was able to have a real business and I realized that the 80/20 rule was the key element in the success in my business. Thank you Yaro for the help! This has given me inspiration and encouragement in an interesting and unexpected way. My husband died last August and I was his full time carer for over 2 years and I have a young child. I came out of this utterly exhausted on every level, unfit, unable to sleep properly, you name it. Whatever I tried to do since in terms of making money has been extremely difficult or I had to stop because I couldn’t cope. My constraint is me – unless I start to look after myself, take time out, build my fitness, have a top diet, have massages, improve the quality of my sleep etc. I will not succeed in making money. Looking after myself and getting myself back on track is the utmost priority otherwise nothing else will work. I have to forget about everything else for a while and build me, not a business. Thank you for giving me a logical, legitimate and scientifically proven reason to look after myself. I am starting right now! It got me thinking about what helped me to keep doing things on a daily basis no matter how crappy my day was. This will, no doubt, change my life. I googled “80/20 rule” after reading the phrase online. This is priceless and has given me much to think about, and even more to act on. Thanks again, Yaro. It's sort of like saying “what is preventing me from moving forward and reaching my goal right now?” Then, attack that with everything you have. Identify and knock down your constraints, one by one. The bonus in doing this consistently is that you build momentum. Success breeds more success. Positive action feeds on itself as you get excited by moving closer to your goal. Thanks for this piece. Your writing is superb! I was doing a search and I say this is the best find on the 80/20 rule. I too am working towards pursuing my passions and and giving back (output). After reading many books on finding your passion and not finding the help I was looking for, your explanation of inputs vs outputs gave me several ah ha moments. Finally an explanation that helped me to understand the importance of creativity and the output of that creativity. A big step in helping me narrow down my blog topic and why I have hesitated in choosing a topic in the past. I heard the term 80/20 rule last night and decided to search for an explanation this morning. Your blog was the first thing that came up and I am so glad it did. Your explanation was good and your examples of doing what truly satisfies you and are passionate about hit home with me. I now feel energized and I am going to do whatever it takes to do what I am truly passionate about. While I’d read elsewhere everything you said, somehow your directness and clarity brought it home. This looks like it’s going to be a game~changer for me. Thank you. I am referring this to a friend of mine. Your passion is reflected from the things you write. One major point that comes across is that you will be successful to convert a passion into a sustainable income – if you are producing output for other people to enjoy or make practical use of. This is the missing dot that I have been trying to figure out for a long time. Thank you. Without knowing what it is called (now I know its the Theory of Constraints) it was the idea of what a friend and I were discussing just yesterday. I have been successfully overcoming obstacles with ‘baby steps’ by breaking things down like this for a few months and I am so grateful for this wonderful tool and your eloquent explanation of it. It certainly aids to free one from uncertainty and find focus and purpose so as to move towards a goal both in a business and personal setting as you explained. Thank you for your candid insights and honest personal anecdotes that add meaning to the subject.